Demystifying the process of completing a college application is what How to Prepare a Standout College Application is all about. Anna Ivey is the former Dean of Admissions at the University of Chicago Law School and founded Ivey Consulting to help college, law school, and MBA applicants navigate the admissions process and make smart choices about higher education. 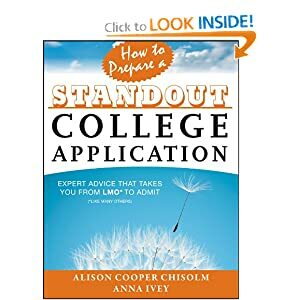 You can find more college admissions tips in their book How to Prepare a Standout College Application (Wiley, August 2013), and follow them on Twitter @IveyCollege. I have worked in college admissions and higher education for the past 15 years and I am always looking for great books that demystify the process of entering college, as I too wrote my own book on this too. This book takes a little different tact and makes the reader consider the application and what helps to make them stand out from other applicants. As a past College Admissions Officer, I have to say that I know that for many colleges this is important, as colleges are more and more utilizing a holistic approach to admissions. What this means is that there is not just one way in which they are admitting students (GPA or test scores alone), but instead they are looking to have a diverse group of students with a diverse group of experiences that are coming into their academic institution. Thus, it becomes very important to consider these issues as a student as you enter high school and start to make choices that will follow you to your college search and application process. This book is written in such a way that it makes it easy to set yourself up well to do just that. The book is clear and to-the-point and filled with practical advice that will assist all students with making the right decisions for their future. The book also is a complete resource and you can tell that it is filled with amazing information that has been collected over time as the authors easily show their ease and expertise in the field itself. All-in-all this was a great book that shares intimate knowledge of the college admission process and is definitely a book that any high school student or parent should check out today!